Some people are brilliant gift givers (my mom is definitely one of those people). I? Am not a good gift giver. In fact, both my husband and I find gift giving stressful enough that we don't exchange gifts for Christmas, birthdays or anniversaries with each other (best system ever, in my opinion). We do, of course, buy gifts for other family and friends. To make this easier on me, we've set up kind of gift "traditions" for various categories of people we buy for. For instance, every year, we buy one children's book for each of our siblings' families with children (this is a total of six families). I choose one book, buy six copies, wrap them and hand them out. I have all year to find a book I like and think they'll like, I can buy them all at once, and when a particularly good deal comes along from a book retailer, I'm ready to jump on it because I know just what I'm getting those families. My mom does this too - every year for Father's Day, she gets tickets for my dad to go to a show in Las Vegas with my little brother. We plan to do what many of you commented on Monday that you do for Christmas with your children - something to read, something to wear, and something to play with. These categories make my life so much easier and help me not spend a fortune and take advantage of good deals. What's not to love? The item we're giving away today is a Dave Ramsey DVD called Cash Flow Planning (it's the nuts and bolts of budgeting). Leave a comment telling us what gift you received in the last year that you loved most (don't worry, we won't tell your mom if it wasn't the gift SHE gave you) to entered. On Monday, we'll announce all three winners. I like that you and Bart don't give each other gifts. My boyfriend's birthday is on Monday, and we're spending it in Cologne in lieu of birthday gifts (or better said, my gift to him is his train ticket and the night in a (cheap) hotel). This way, we get to make memories and I don't have to stress out. We've decided to make it into a tradition of sorts, whenever possible, to go somewhere for our birthdays instead of giving a present. The best gift I ever got was the Complete Calvin and Hobbes. It was my graduation present when I got my masters, and I loved it because I've read those comics ever since I was a kid, and now I have them for my own. My husband and I are stressed gift givers as well so we normally don't do gifts for each other but last year we bought a better camera so we could get good photos of our newborn. It was something we picked out together and "gave" to each other but I love it because it captures the memories we have with each other and our son. YAY!!!! It's so true gift giving can be stressful (for me) Ryan and I usually just say 'this is nice' and it sort of takes the surprise out of it but what can you do- Ryan DID surprise me and get me a camcorder! Awesome because now we cna capture our daughter growing up and the memeories we make as a family! My mother-in-law got me the Little House book series for my birthday last year. It was something that I specifically requested, and I enjoyed it as much as I thought I would. The best gift I received in the last year is home videos from my mom. She took a bunch of our home videos of me as a kid and even some of my grandmother who passed away when I was 7 and had Costco transfer them to DVD's. It was great being able to sit around at my house with my husband and kids and laugh and share stories while watching the home movies. The best two gifts I have received so far are my engagement ring on Christmas morning and the trip to Orlando to visit the Wizarding World of Harry Potter for my 30th birthday, both from my fiance. Each was amazingly special & I will cherish and remember them always. Best gift, huh? I'll take the cop out--my new baby boy! Aaron and I don't do gifts either. I wish he'd give me gifts but I don't want to get him anything. That's totally unselfish, right? I kind of got Jones for my birthday, does that count? He was a stinking expensive gift. I like your idea of a childrens book for those with children. I think that is something that anyone with kids would love. For a recent... well.... there were quite a few good ones, but my sister bought me the Pioneer Woman Cooks cookbook-- and I love it! The other actually DID come from my mother. A percolator coffee pot. It makes the most wonderful cup of coffee. I used to be a Starbucks junkie. I haven't bought a coffee out since I got it. Awesome! My husband and I rarely give each other gifts either :). It makes me life so much calmer and happier. I also love the idea of multiples of the same gift. I try every year to come up with my "birthday" gift of the year. Sometimes I am successful, sometimes not. I'm goign to have to think over the idea of giving the same thing to someone year after year. Hmmm. Let's see, best gift of the past year? Well my birthday is next week... but as I think on the last year, I'm going to have to say it's a toss up between me ginger sewing scissors (from my mom) or the dehydrator (from my mother-in-law) that came last Christmas. Both so great. Last year for Christmas, my husband bought me a simple, cute picture frame and put one of his favorite pictures of us in it. I LOVED this gift because it was simple, it showed what he liked, it was a memory of us and definitely didn't require money to show the care that went into it. The picture is now hanging above my sink and I love being able to see it everyday! When we got engaged, Dave gave me a poem, The Passionate Shepherd to His Love, by Christopher Marlowe. This year for my birthday, Dave printed it on nice paper and framed it for me. Very cheap present, but extremely romantic and meaningful for me. The best gift I have received this year is a Kindle. It was something I really wanted, but wouldn't buy for myself. My best friend suprised me with it as a college graduation gift. I was so shocked, but it made me feel so loved. Bonus is that I heart my Kindle! I always find the best gifts to be experiences that yield good memories. Of course sometimes material things are lovely too, but all of my most memorable and favorite gifts have been activities. My husband enjoys woodcarving and worked for hours to make me a ring out of a single piece of wood. I'm almost afraid to wear it! But is brings a smile to my heart everytime I see it! We were going through our old clothes one day to give to donations and Nathan found the shirt he wore when he proposed to me. It didn't fit him anymore, but I refused to let him throw it away or donate it...someday I would figure out some neat, sentimental, crafty project to use it in. Well he took the initiative and surprised me by having a member in our ward turn it into a teddy bear. (She takes sentimental fabrics, shirts, blankets, etc. and makes them into cute, lovable bears) He gave it to me for our Anniversary. Definitely a favorite gift for the rest of my life. Either the necklace M got me in Hawaii (heart shaped from coconut wood, I wear it all the time) or the mug from Starbucks my bf got me for Christmas. It's so much nicer that the inexpensive ones I buy. I used it every single day at work. A new laptop from my husband. I had my desktop but it was almost 7 years old. Best Gift Ever has to be our Anniversary gifts. When we were newlyweds and didn't have any money we would save up and on our Anniversary buy a piece of nice furniture for our home (lots of times from consignment stores) We still continue that tradition. Part of the reason it is the best is planning it out with Ken and dreaming about different options together for months beforehand. My husband grew up in the country so it's easy to buy him gifts because he likes luxury-type appliances and household items but is too frugal to ever buy for himself. Things like bath sheets, a juicer, double headed shower heads, and fancy waffle makers totally makes his day. This year I am surprising him with a Hot Chocolate Maker. Favorite gifts we like from parents is food storage and trees for our yard. It's comforting to know my dad planted that tree just for me. My sister-in-law couldn't afford gifts this year, so she gave gifts of service. She gave her college-aged brother some frozen dinners, for example. But her gift to me will be hailed as one of my favorites forever. She gave us one date night a month. She'll come babysit once per month so we can go on a date. It's wonderful. Even when life gets hectic and crazy, we're guaranteed one free babysitter every month. Love. This year for mothers day I got a house! We moved in right near mothers day and it was a dang good gift. I too, get stressed about gift-giving, and I think it has to do with the fact that unlike some, I don't feel like gift-giving is one of my love-languages. How could I possibly buy or make something that truly reflects how I feel about a person? Your ideas are great ones. The best gift I got this year was, appropriately enough, from my mom. It was some new clothes that I absolutely love! Probably the most practical gift in the past year was a nice Home Depot gift card from my parents, which we put towards our new windows. My parents are good gift givers. :) My favorite gift from my husband would be the Bible he bought for me last Christmas. Bet you didn't know I read this:) Just for the record...I love gifts. Giving, receiving- it all. I love thinking and thinking of a good gift Dave will just love and I love to see what he will come up with to get me- I can't imagine a world where there are no gifts exchanged between Dave and I. Sad. Is that bad of me to say that I like to get gifts as well as give them? Oh well. IT'S TRUE!! (Can I still be eligible for the drawing if I didnt list a gift I received? :) I have an awful memory. We usually buy gifts for each other but I stress about it. I never know what to get people (especially guys). So I usually end up buying a gift card. Impersonal (I know), but practical. Even if I ask my husband not to get me anything he still does and then I feel bad for not getting him anything. So, then we end up trying to beat each other at getting the "best gift ever". My best gift last year was my husbands brothers and sisters got together and did Christmas for the kids since we were low on money while my husband was in school. It was very thoughtful and without them it would have been a very sad Christmas. They did way too much. I love giving thoughtful homemade gifts. It is so much fun! The best gift I've received in the last year would be a beautiful milk glass sugar bowl that my husband gave me for our anniversary. Love it! Best gift was the anniversary trip to New York City we took last month. BEST GIFT EVER. And we did it right and spent next to nothing (frequent flier miles, stayed at a friends house, free babysitters). My most-loved gift is probably my series of Little House books that I received in 4th grade. One thing I've been doing in preparation for the holidays this year is monitoring Groupon in the cities where my far-flung families live. I plan to purchase Groupons that will allow my siblings the opportunity to have an evening or day of fun, rather than another unwanted thing to clutter their homes. We always do movie night Friday at our house and I always make popcorn on the stove and put it in a tupperware bowl. My Sister-in-law knows this and so last year she gave me an old fashioned popcorn popper for the stove and a really cute ceramic bowl set that said popcorn on it. It made my Christmas because she put thought into something that she knew would fit our family! The best gift I got this year was the gift my *new* husband and I saved forever to give ourselves....a honeymoon to Jamaica. It was worth every penny. I received tickets to see a comedy show from my boyfriend! It was a blast to spend time together, instead of getting something that would end up sitting in my closet. Love your blog!! The best gift I got this year I actually received yesterday. My brother came in town and borrowed my car to run some errands while I was at work. When I got off work he said he had bought me something and to check out my tires when I got out of the car. He had bought me 4 new tires while I was at work!! I couldn't believe it and couldn't get over what he had done. When asked he said he didn't want me driving on those tires anymore and he also wanted to do something for my family an our baby on the way in Feb!! Thought it was very thoughtful and something I desperately needed yet would have had to wait a couple more weeks to get myself. I suppose I stress about it too, but to a lesser degree, but I think the best gifts to give or receive are homemade. That being said however, my favorite gift last Christmas was the case of Stephen's amaretto hot chocolate given to me by my husband - I had attempted to find some (in vain) when we were in Utah for Thanksgiving. It was also the only thing I didn't know I was getting. Surprises really are the best things ever. My favorite gift I received this year was my very own sewing machine. 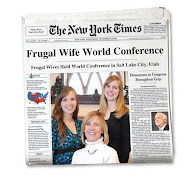 Quite the thing for the frugal wife. Now I can make things like baby bibs and Halloween costumes for a fraction of the price it would be to purchase ready-made. I love your idea of doing the same thing for every family with kids and a book is genius. Everyone will enjoy that! My best gift in the last year was the digital piano I got from my parents/parents-in-law for my college graduation. I love being able to have music in my home again. I was excited when I found your blog recently! My husband just graduated from Dental school, so we'll be starting the loan repayment process shortly and I (we) need all the help and good advice we can get! So, thank you for taking the time to do this. My favorite gift was a poem my husband wrote for me last Valentine's Day. Sounds so cheesy, but what he wrote was what I really needed to hear at that time - and made me feel much better than anything he could have purchased last minute. Ha! The very best gift I have received was for my birthday this year. My husband is a professional musician, our daughter is an accomplished brass musician and our son is a budding singer (but quite shy about it). I had been lamenting (OK . . . more like complaining) for quite awhile that although my husband and daughter performed frequently I never got the chance to hear them. Schedules are crazy, baby on the way, homeschooling -- you get the picture . . . .
Well, they put together a private concert --- just for me. They chose all my favorite songs and music, much of which they never had performed in public. All I can say is that I am so very glad that we recorded it because I cried through 90% of the performance. It was the most AMAZING gift!! The best gift I got this year was from my boyfriend. I received an engagement ring! Best gift in the last year is my HP Laptop. My husband bought our girls their own and I watched them open them with so much excitement. I was happy for them of course, but envious as well. My computer was on the brink and their new ones were so....NEW! After all the gifts had been opened he plopped the big wrapped box on my lap. He surprises me with something every year! I have to do something for him this year! It wasn't in the last year but I have used it everyday since received it! My mom made me a tied fleece throw blanket. It's my go-to blanket when plopped on the couch. I use it everyday. Best gift this year has been my sewing machine from my husband. It was the perfect gift and perfect surprise for no reason at all.